COULD PAY OFF SO HANDSOMELY. We're looking for dogs. Big dogs, little dogs, dogs with no tails, purebreds and mutts — it really doesn't matter. If you're a member in good standing of the genus Canis, you're in. All we ask is that you give us honest feedback on our products and send in a picture. In exchange for being an official Dawg Tired field tester, you get some sweet pooch swag. Specifically, a Dawg Tired collar tag, cookie pack and we'll even throw in something for your owner: a 100% cotton crewneck Dawg Tired t-shirt or hat. Oh yeah, the picture...we'll post your mug on our site for the entire world to see. Who knows, you may be discovered by some big wig Hollywood dog wrangler. Or not. Just shoot us an email here at Dawg Tired. Attach a photo (Limit 100 KB, .jpg format). 1. Pay attention to the lighting. If possible, snap the photo with the sun at the photographer's back. 2. Of course, make sure your Dawg Tired bed is in the frame. Lola loves her DT bed! Don't let her fool you - she should have a black leather collar with metal spikes instead of her pretty pink one. When our new beds arrived, we were so excited to have something brand new to relax and kick back on. My mom took the photo you see here. That's me, Czar, the Great Pyrenees, all ready to take a nice long nap. My name is Osa. I'm a big cuddly Newfoundland. 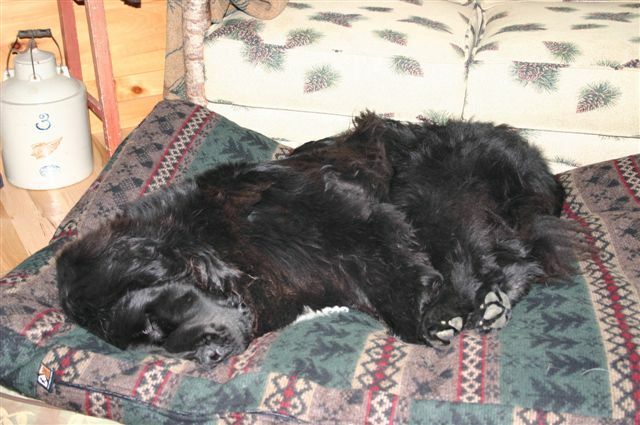 And when my new bed came, I crashed as soon as my big old Newf frame sunk into my brand new digs. I'm still a puppy even though I am already 125# but while I snooze away, I'll be dreaming of someday becoming a Pet Therapy dog like my brother, Czar. Cuz' he rocks.